As someone who always uses a backpack, I wasn’t too excited when it came time to reviewing Jansport’s Tarmack TST1 messenger back for laptops. I generally prefer backpacks because they are spacious and comfortable. One the other hand, messenger bags fit into a work environment better, making a viable solution in different situations. The Tarmack is a part of Jansport’s professional lineup of bags for carrying expensive gear. It perfectly complements the Hookey backpack we reviewed last year. While a single zipper offers instant access to the main compartment on most backpacks, messenger bags generally have an extra flap and belt to secure things into place. While it may offer some additional protection, it is often a hassle especially if in a hurry. Fortunately, the Tarmack features only a single belt clip and a magnetic strip for easy access. The bag can expand quite easily and even offers a pouch on the side for a water bottle. 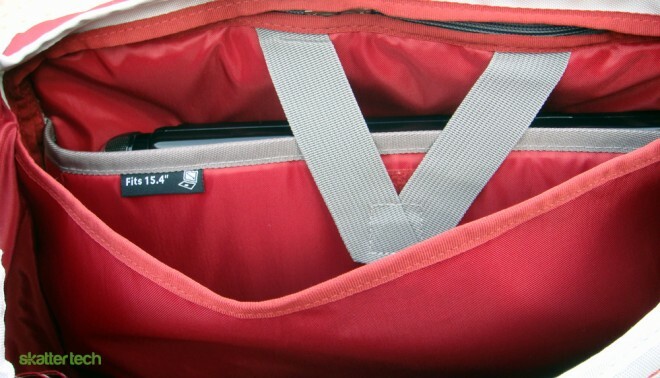 Jansport claims enough room to hold a 17 inch laptop and a few 3-ring binders. I was able to fit a 15.4 inch laptop, a 10 inch netbook, two charging adapters, a 200 page novel, and two slim notebooks inside. The inner compartments make it easy to keep things organized and separated. 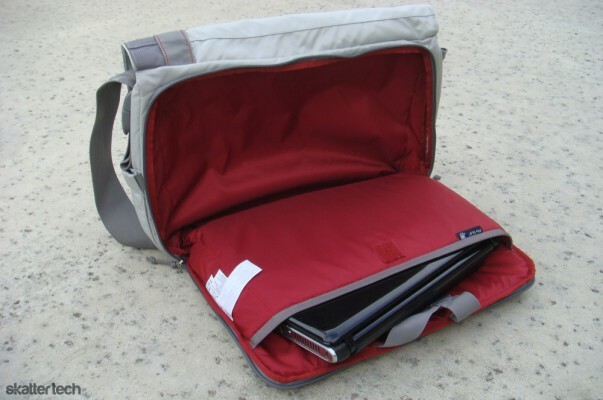 The laptop pouch offers some padding and prevents other sharp objects from scratching your computer. There are also several other small pockets to store items such as a wallet, MP3 player, headphones, or pens. My only disappointment came with the shoulder strap. Despite the adjustable nature, there was often too much excess which would not tuck away easily. Unlike most messenger bags which are fairly monotone, the Tarmack I received came in a optimus grey color scheme. However for the more traditional, the bag is also available in all black. While the grey colors were somewhat dull, it will probably fit well for commuters, students, or travel. Business professionals on the other hand should probably opt for the black mode. For those concerned with susceptibility to dirt and stains, I was impressed to how resistant it was despite the light colors. I also like Jansport’s style which I find quite contemporary and modern. For instance, it features a bright red inside that will definitely attract some eyes. 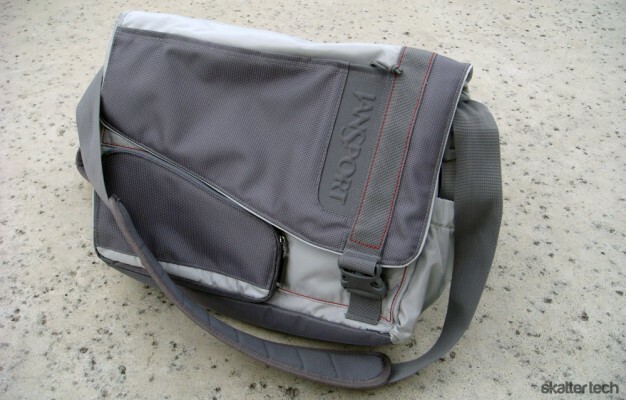 Unlike backpacks, messenger bags do not evenly distribute weight across both shoulders. If you are someone like me, you may have a hard time getting used to this. While the shoulder strap offers some minimal padding, a heavy bag will get painful very quickly. However if you are a light traveler, it should not be much of an issue. I should note that backpacks are probably better for posture and to avoid back problems over messenger bags. This bag is great for simply getting stuff from the car in your parking lot to your office, but not for long commutes or trips. After completely switching to the Jansport Tarmack for a few weeks, I can safely say that it was better than most messenger bags I have tried. The design felt different, the inside compartments were well-organized, and it offered decent laptop protection. I would love to have one of these for carrying stuff to meetings, interviews, or presentations. However the price tag was a bit shocking. Most retailers charge over a $100 for the bag. At that price, I am fairly positive I can find a pretty impressive back pack. Even the Jansport Hookey would be a better solution, if it could serve your needs. However I should note that the build quality was impressive and that this bag will not fall apart even after some heavy use. If you do go with this bag, you probably not be disappointed. Notice: This article was originally contributed by Akshay Aanabathula and edited by Sahas Katta.